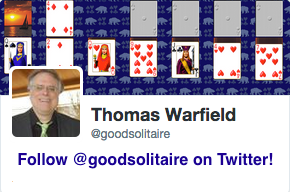 Screen shot of the game Spidercells from Pretty Good Solitaire. 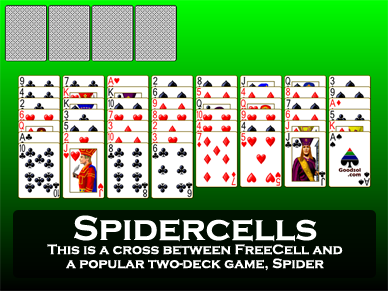 Spidercells is a FreeCell type game with the Spider characteristics. There are eight tableau piles. At the start of the game, the cards are dealt out exactly as in FreeCell, 7 cards to the first four piles and 6 cards to the last four piles. All the cards are face up, making Spidercells an open game. 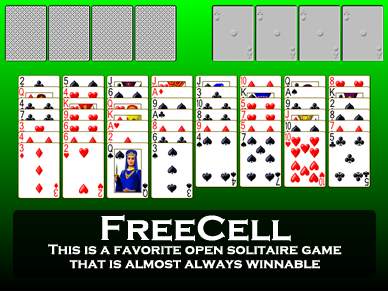 There are four cells, which work exactly like the cells in FreeCell. One card may be moved to each cell. The card in the cells is available for play on the tableau. There are no foundation piles, all of the play takes place in the tableau and cells. The object is to create four sequences of 13 cards down by alternate color from King to Ace. When all the cards are in these four sequences, the game is won. 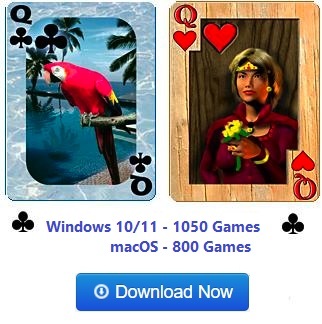 An average player wins Spidercells nearly 90% of the time, but good players can win the game pretty much every time - like FreeCell itself, nearly every game appears to be winnable.